Here are some of the words and thoughts of some of the head coaches after their games last week. “We knew the thing we had to do was make them drive the football because they can score from anywhere on the field. I thought our defense did a great job of containing. We didn’t do it all the time, but you’re not going to hold players of that ability every time. We felt like we were going to have to score four or five touchdowns because Dadeville can score on any play, and I thought the kids did a good job. 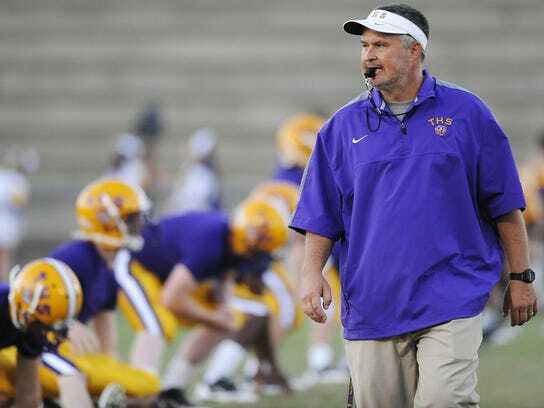 Tallassee Coach Mike Battles Jr. after his team beat Dadeville 54-13. “I told them (at halftime) not to play the scoreboard, play the game. You can’t be looking at the scoreboard and seeing what the score is, you’ve got to play all four quarters. ” Lafayette Bulldogs Coach James Lucas after his team’s 40-0 victory over Horseshoe Bend. “Them blitzing gave us a lot of problems up front, kept us from running the ball like we wanted to. Any time you’re one-dimensional, it makes it hard. We’ve got the next three games as region games, we’ve still got a shot at the playoffs, we’ve just got to play hard for four quarters.” Horseshoe Bend Coach Josh Averett after his squad’s 40-0 loss to Lafayette. “His track helped him out tremendously. He was a young football player last year, but the confidence he got running track and competing on that level really spear-headed his mentality.” Reeltown Coach Matt Johnson talking about runner Cameron Faison who rushed for 151 yards on 14 carries in a 34-28 victory over Ranburne. “It’s good to smile again; it’s definitely a win that we needed.” Russellville Coach Mark Heaton after his team’s first win of the season, a 42-21 victory over John Paul II. “It feels good to get that first win of the season. I know its tough for Asbury to have to play 10 games on the road (Asbury is in the process of building a stadium although it will not be ready for play this season). It’s really good when everybody gets to play. That’s the nice thing about getting a win like this, because you get to play everybody.” Gaston High head coach Swane Morris after his team’s 47-0 victory over Asbury. “I was more upset of our team turning on each other. We’re nothing without unity. If you don’t have unity you better be superior athletically and we’re not.’’ Brewer Coach Geoff Walters after his team loss to Fort Payne 39-14. “Our guys played good.” Pike County Coach Fred Holland after Pike County’s 65-0 win over Central Coosa. “We’ve held a lot of opponents to just one score. And we’ve been talking about this all year. We know we’re better on defense than what we show sometimes, and not being able to shut opponents out irks us a little bit because we have the ability to do that. Tonight, we went in at the half and we preached making sure that we do that. And Coach Jacobs promised the team donuts if they could shut them out.” Coach Ezell Powell of Georgiana after his team’s 55-0 victory over Red Level.